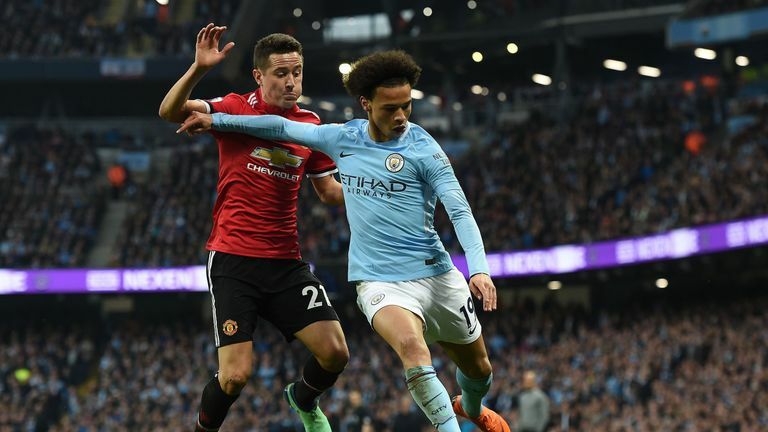 The mouth-watering Manchester derby is live on Sky Sports Premier League from 4.15pm on Sunday - and below we've rounded up the must-read pieces ahead of the big match. Unbeaten Manchester City host Manchester United at the Etihad Stadium aiming to stay top of the Premier League - but can Jose Mourinho's men cause an upset like they did in the same fixture last season? How is Riyad Mahrez improving Manchester City? Why are Aymeric Laporte and John Stones now Pep Guardiola's favoured centre-back partnership? And how has Sergio Aguero changed his game to suit Guardiola's style? Do Manchester United have the players to compete with the Premier League's top teams? How does their style differ from rivals City? And is Paul Pogba really a big-game player? Are Man Utd good enough? From recent records and United's results at the Etihad to why Anthony Martial could be key, we pick out the essential stats ahead of the big game. United's Martial and City's Raheem Sterling go into the game in fine form - but which one of them topped the Sky Sports Power Rankings this week? Martial or Sterling: Who tops the Power Rankings? Has there been a power shift in Manchester? Has Jose Mourinho or Pep Guardiola had a bigger influence on the Premier League? And just how do you stop Manchester City? We asked the Soccer Saturday pundits for their views. Pep or Jose: Who has had a bigger impact? As well as all the serious analysis and predictions - we've also got some fun interactive games for you to play! Take our Manchester derby goalscorers quiz!